All across our country, a cold front has brought plunging temperatures in the last week. Coastal Georgia was not spared! 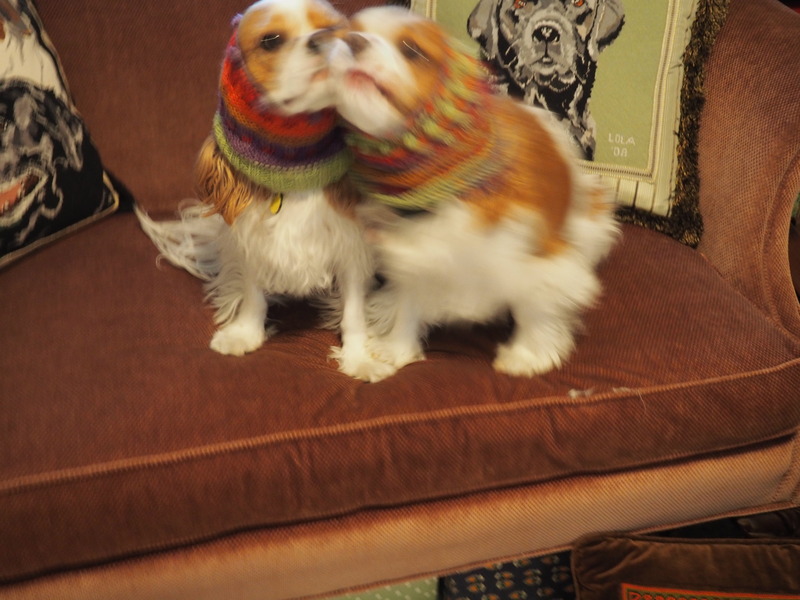 Moving to temperate Georgia, I thought that the beautiful snoods that my sister knitted for the spoiled girls, would be put away in case there were any Wintry trips North. But we had plunging temperatures in the 30’s! 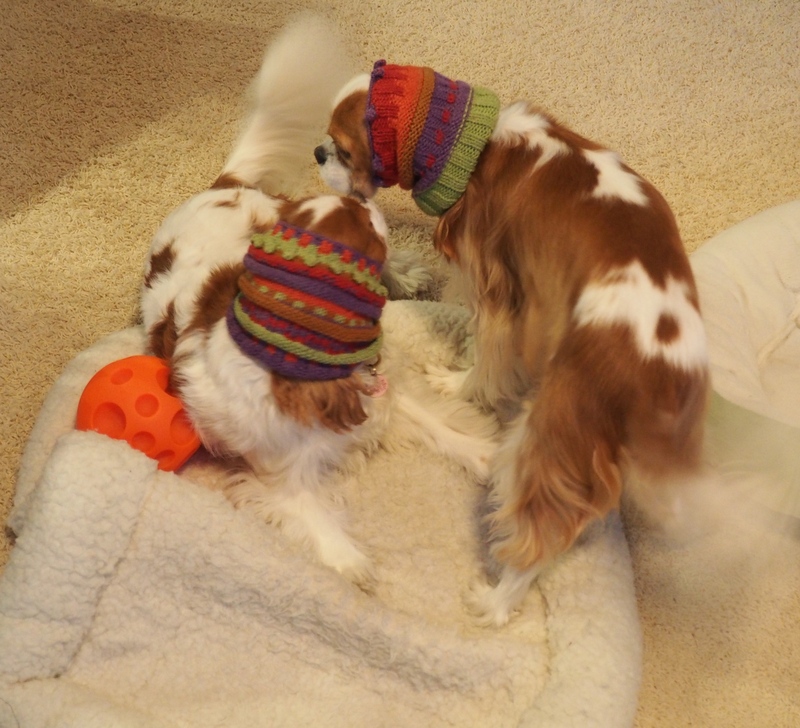 Two of my all time popular blog posts are about snoods for the Cavalier King Charles Spaniels, so it seemed time to revisit the subject. 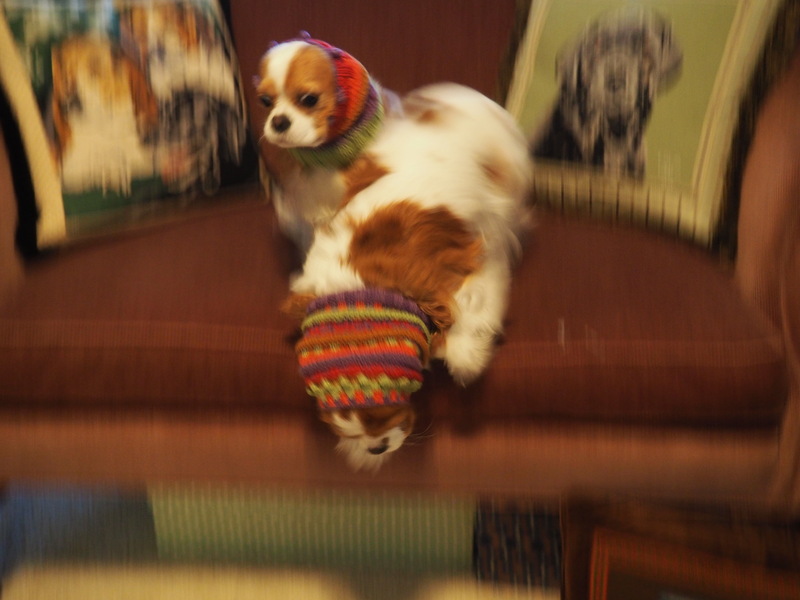 Put the light fabric snoods away and get out the wool! This is what the Cavaliers had to say about that! 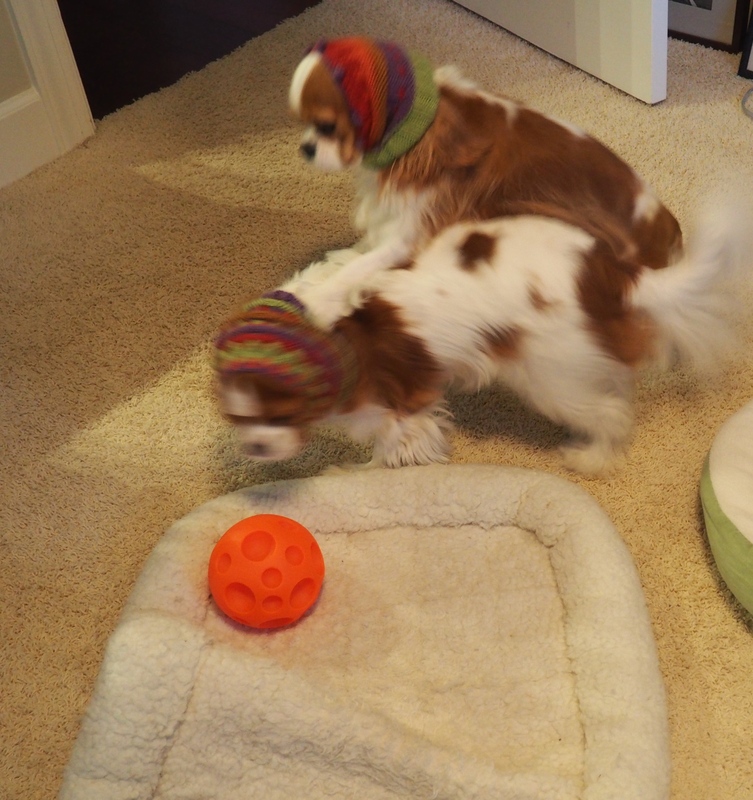 Oh no, here she comes with the PRETTY snood that I’m not supposed to dip in the food bowl! P.S. 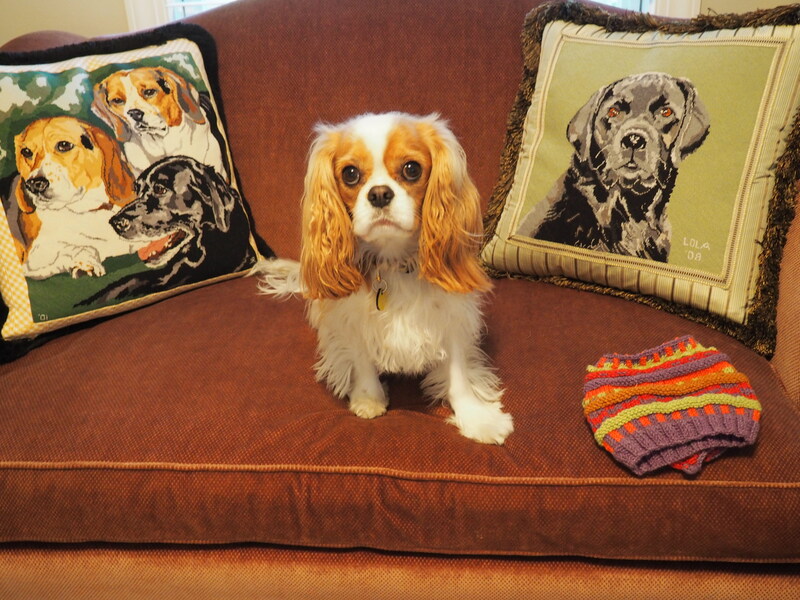 When is the needlepoint pillow of ME going to be finished? Sister, what do you think about this? Just smile, let her take the picture, and we’re out of here! It’s never that easy! She wants everything PERFECT! You are going where? Escape? Oh no! Just because she has the camera in front of her face, doesn’t mean she can’t see what we’re up to!!! Wait, I almost forgot the magic ball! Wishing all my readers a Happy Thanksgiving! May your week ahead be filled with food, fun, family, dogs and thanks! At the heart of the controversy over immigration reform, I think we can accept, with the exception of the native North American Indians, that we are ALL descended from immigrants. Open your heart, be part of the discussion, but never forget the blessings immigrants have brought our nation. THANK YOU to my family – some came on one of the first ships to arrive, true Pilgrims in a strange land, and others followed from England, France and Germany. Wherever you are from, remember to be thankful for your ancestors who bravely came to this land for a better life. Giving Thanks! 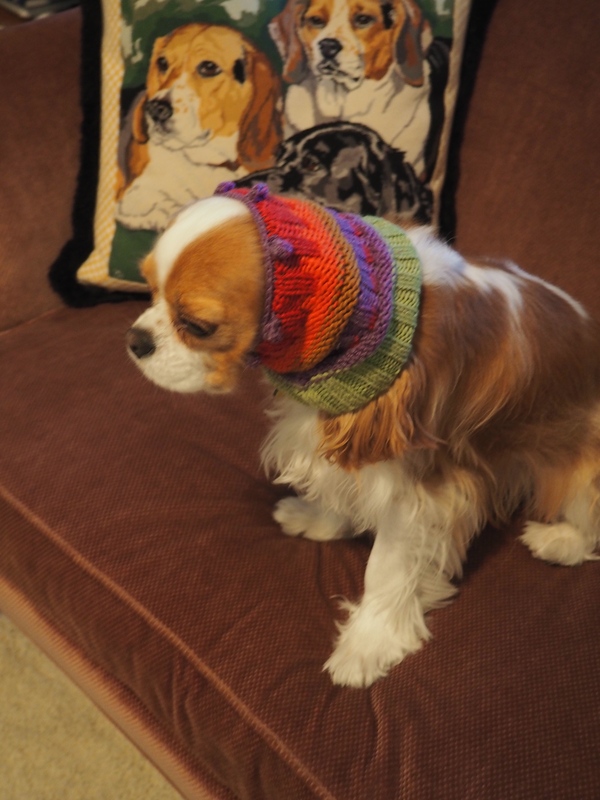 This entry was posted in Uncategorized and tagged Cavalier King Charles snood, cavaliers, immigration and Thanksgiving, snood, Thanksgiving. Bookmark the permalink. This had me nearly peeing in my pants. Sorry for being so graphic. 😉 Your pups are adorable. Thank you so much for your note. I do love Black and white photography. It’s a totally different eye, so it makes me think differently. Have a wonderful Thanksgiving! Some of my ancestors came over on a ship with Roger Williams that landed in Rhode Island. I wish all immigrants the opportunity to prosper through the filing of proper paperwork, hard work and the joy of paying taxes just like the rest of us lucky souls. 🙂 Happy Thanksgiving to you and yours. Wow, 30 degrees! That will certainly put you in the mood for the season. I’m with you, we all need to be mindful that we all have family that came to America from someplace else. Wish you and your family a Happy Thanksgiving! well said Judy – especially the taxes! Karen, you read their expressions correctly! Hi Jayne, I must say I didn’t think you would need them there! We’ve been having such mild weather I think it’s only once or twice the temperature has managed to drop to the 30’s and that was only briefly for the coldest part of the night. 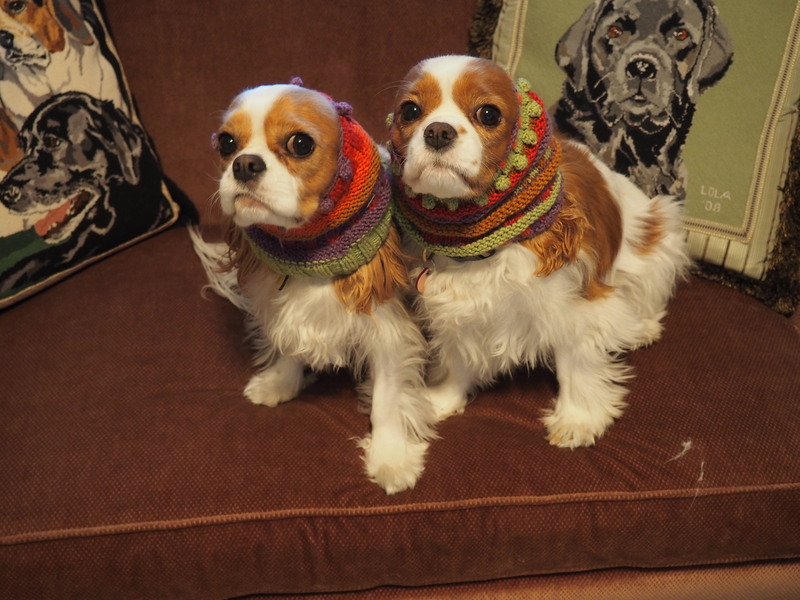 Your dogs do look very cute and snug in their snoods. Cute dogs! And I agree with your sentiments on the immigration controversy. My paternal grandparents came from Russia as children around 1910, and they never did learn to speak English without an almost impenetrable accent. My maternal grandparents came from Austria a few years earlier. All built what is generally considered a successful life for themselves and their descendants.